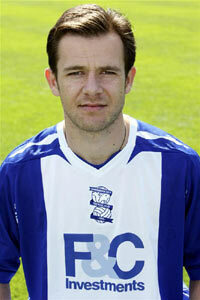 Rafael Schmitz signed on loan for Birmingham City for the 2007/08 season from French club Lille. You’d think having a Brazilian in a Blues side would make him stand out but of all our centre-backs from that season I remember him least – which isn’t that surprising if you think that the other players Blues had that year at centre-back were Liam Ridgewell (bless his cotton socks), Johann Djourou (on loan from Arsenal), Martin Taylor (who made that tackle on Eduardo in February 2008) and Tunisian man-mountain Radhi Jaidi. Schmitz was everything you’d expect from a Brazilian; a good passer, technically proficient but not much of a defender. However, it’s harsh to say that he wasn’t good enough – he’d have prospered with a good partner in the heart of defence but having to play with the likes of the very raw Djourou or the then fairly poor Liam Ridgewell meant that Schmitz wasn’t afforded the luxury of being able to bed in as Blues fought for their Premier League life. After picking up an achilles injury shortly after signing for Blues, it wasn’t until September 2007 that Rafael made his Blues debut when he started in the 1-0 home win over Bolton. Despite not being the tallest pairing with Liam Ridgewell, the two coped admirably with the tall and strong Bolton forward line and kept a clean sheet – Schmitz ending the game needing stitches in a knee wound after being taken out by Javier Garrido. However, that was to be his only win playing under Steve Bruce as Blues endured a torrid run. In December Schmitz found himself playing for a new manager a few months into the season as Bruce was tempted by Dave Whelan’s wad of cash to move to Wigan and Blues appointed another former centre-half as manager in Alex McLeish. McLeish’s appointment sounded a death knell for Schmitz as he only made seven appearances after Big Eck took on the job – of which Blues only won one, thanks to a last minute screamer from Seb Larsson at White Hart Lane in Eck’s first game in charge. His last game was a 2-0 defeat to Sunderland strewn with errors, gifting the Black Cats their first goal as he left the ball to Maik Taylor and/or Franck Queudrue – who left it to him. It led to him being dropped and then dumped into the stiffs. However it wasn’t all bad for the Brazilian – he did leave after winning a trophy. Unfortunately for Rafael, who had played in the Champions League with Lille it was the Birmingham Senior Cup, with Schmitz playing 90 minutes for the reserves in their 5-0 thrashing of Burton Albion in the final. This entry was posted in The Samba Series and tagged alex mcleish, birmingham city, brazil, rafael schmitz, samba series by The Samba Series. Bookmark the permalink.